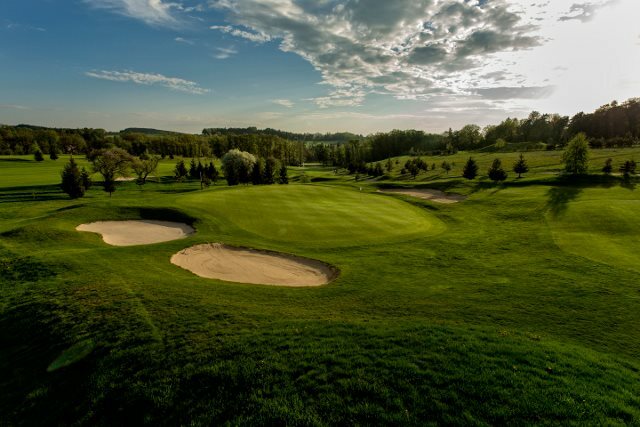 One of the most beautiful golf resorts in the Czech Republic is situated 40km from Prague. Two 18-hole championship courses and a 9-hole public course accessible to players without a Green Card are naturally incorporated into the rolling landscape surrounded by woods and interwoven with many water hazards and bunkers. In the heart of the golf resort, which was built in cooperation with the PGAE association, you will find the chateau hotel, a golf shop and equipment rental facilities. You can choose from the chateau restaurants Steak House and Tee No. 19 in a reconstructed farm building. You can unwind after golf with a tour of Konopiště Castle, and Jemniště Chateau is also worth visiting.